Heat oven to 180C/160C fan/gas 4 and line a 20cm square brownie tin with baking parchment. Beat the butter and sugar together with an electric whisk, then add the eggs one by one. Sift in the flour, cocoa powder and baking powder, and add the milk. Mix everything together, then stir in the chocolate chips. Bake for 30 mins, or until the top is set, then cool completely. To make the topping, melt the milk chocolate, cool a little, then mix it with the soft cheese. 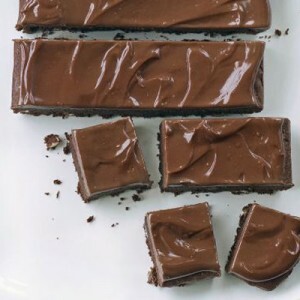 Spread over the cooled brownies and cut into small squares – these are very rich.